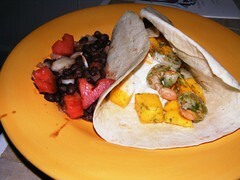 I love mangos…my two favorite ways are as shown – with shrimp – my second is with spinach and goat cheese in a nice salad. Saute shrimp in garlic, cilantro, olive oil and a little salt – remove from heat and add chopped mango. Fold into wrap with cheese, salsa (I used the salsa verde) and sour cream (I prefer plain yogurt). Drain and rinse one can of black beans, simmer with chopped tomato, onion and about a tablespoon of olive oil…throw in a dash of hot sauce for good measure. Heat until warmed through. You can also top the beans with salsa and sour cream to serve – I chose to eat them as is. 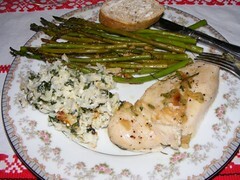 Very delicious dinner and WAY too easy not to try it yourself. I had a day of cooking the other day – trying to get ahead for the week which I did. One of my favorites is Mac & Cheese and I am always tweeking it to whatever cheese I have around the house. This batch I had Monteray Jack , Cheddar and Fontina Cheeses. whisk together until it well formed…slowly add in 2 cups of milk – a dash of salt and pepper and a dash of dry mustard. Reduce heat – stir – and allow to slightly thicken. 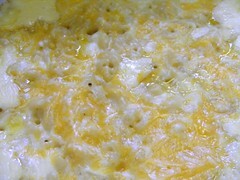 Add 2 cups of grated cheese – for this one I added about 1 cup of Jack/Cheddar mixed together and 1 cup of Fontina. Bake for 25 minutes until bubbly. I served this alongside some salmon patties which I did not get a picture of – DOH. Tuesday was the first day of classes so naturally I came home tired and confused at what had just happened. Why was I not sitting on the couch watching the Olympics. Why am I wearing dress clothes? In the confusion dinner was the last thing on my mind. I decided to make a pizza with some yummy leftovers I had in the fridge. 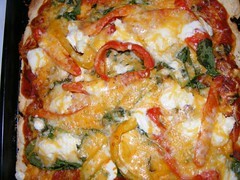 I had roasted red and yellow peppers the other night for a salad -so those when on the pizza; I added fresh basil, fresh spinach, some of the ricotta from the quinoa bake the other night, a bit of feta which I always have around and then assorted cheeses on the top. It was delicious! The crust is the same I have been using for a while because its easy and you don’t really have to plan ahead. I posted it a while back – I’ll re post so you don’t have to go digging through to get it. Preheat oven to 425 degrees. Mix ingredients together and then transfer to lightly floured surface – prep your baking sheet with either cooking spray of corn meal and then transfer the dough to the baking sheet and form to the pan – I used a rectangular baking sheet so I could spread the dough a little thinner and get a nice crispy crust, you can choose your favorite way and it should work fine. 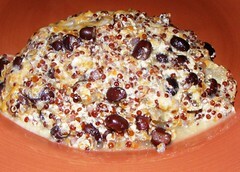 One of my new favorite foods is quinoa. I have found I can substitute it in any dish that calls for rice or couscous. And completely out of character for me, I like this AND it’s actually better for me. So anyhoo- I found this recipe somewhere (don’t remember where) and wrote it down on a scrap of paper. I finally got around to making it for dinner day before yesterday. It contains 2 of Dev’s least favorite things- pinto beans and cottage cheese. However, he went back for seconds, so it can’t be that bad…. 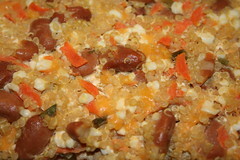 Stir in pinto beans, cottage cheese, yogurt and parsley. Spoon into lightly greased baking dish and bake uncovered for 25 minutes on 350 degrees. Sprinkle cheese and back another 5 minutes or so. It really was good, and pretty good for you. The pic doesn’t do it justice. This recipe will most definitely go into the regular rotation! We had a celebratory dinner tonight for my Dad’s 70th birthday – it was a week late due to our busy lives, but non the less fun and I had time to attempt my first layer cake. I don’t have a fancy recipe to give, I used a Duncan Hines French Vanilla cake mix and some Pilsbury icing because it was the only one I could find without high-fructose corn syrup. 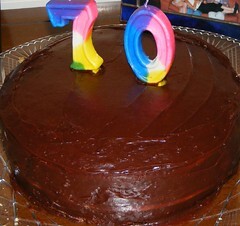 It was a tasty cake – we have lots of left-overs even after sending some home with Mom and Dad and we never eat sweets, so this will probably sadly go to waste, but it was a fun endeavor that Dad seemed to enjoy.